Derek is married to Mallory and they have a two year old son, Gavin. Derek graduated college in 2011 with an education degree and spent five years teaching seventh grade social studies at Opelika Middle School. Derek completed Highlands College with a ministry certificate in 2017. 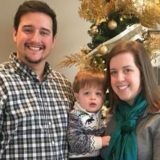 He was hired as Young Adults/Small Groups Pastor in July 2017 and became Solitude’s Youth Pastor in August of 2018.